Slice 1/4 inch off the tip of each onion; peel off skins, leaving onion base intact. Carefully cross-cut onions, twice, nearly to the base (but keeping base intact) so you end up with 8 segments. Use fingers to carefully separate segments into petals. Pour buttermilk into a small bowl. 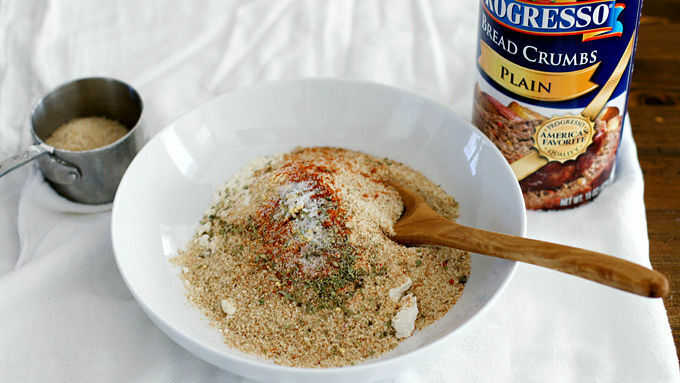 In a separate shallow bowl, combine flour, breadcrumbs, garlic powder, oregano, salt, paprika, mustard, pepper and cayenne pepper until well mixed. 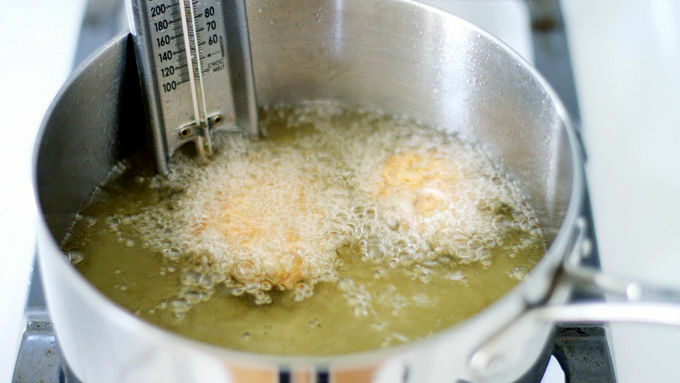 In a small saucepan over medium-high heat, heat 2 inches of oil to 350° F.
Quickly dip onions, one at a time, into buttermilk, then roll in breadcrumb mixture. 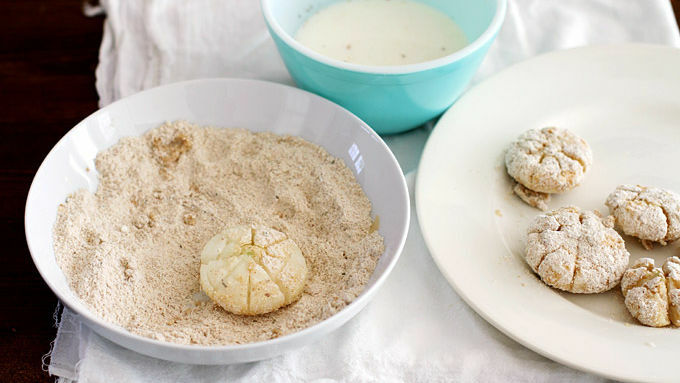 Dip again in buttermilk and then roll again in breadcrumbs. Drop a few onions at a time into hot oil. Fry 3 to 4 minutes until golden brown. 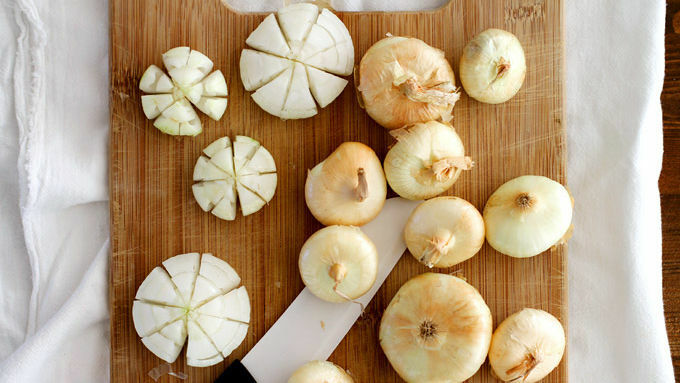 Use a slotted spoon to transfer onions to a paper towel-lined plate to drain. When all onions are fried, make the dip: Combine dip ingredients in a small bowl until combined. Top with chopped fresh chives, if desired. Serve immediately with onions. Don’t substitute pearl or boiler onions for the recipe: Cippolini onions work best. 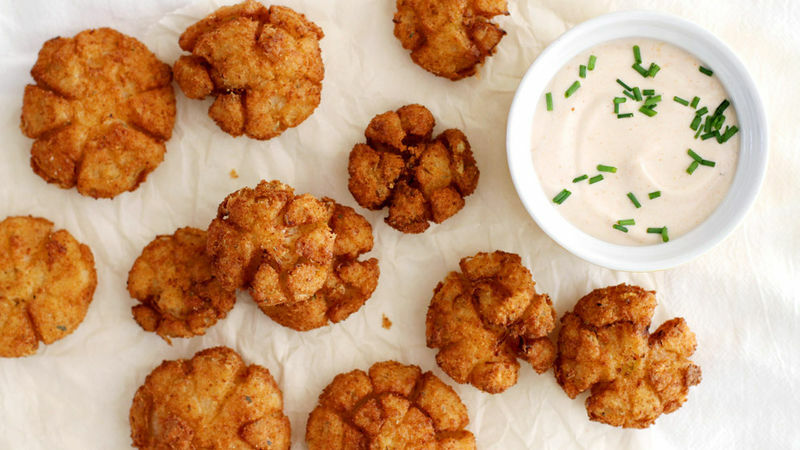 You've seen the large blooming onions at happy hour. Now they're perfectly mini for a party! Smaller size, same amazingly addictive snack. I’m fairly certain that my childhood consisted of just the following foods: pizza, spaghetti, those yogurt cups with sprinkles on top and blooming onions. Every time we went to a restaurant that served the petaled fried onion with creamy dip on the side, we ordered it and I devoured it. It’s a memory that I treasure with much deep-fried nostalgia. In recent years, however, those blooming onions have been fewer and farther between in my diet. But every once in a while, I get a serious hankering for one. Since I probably shouldn’t just make one giant onion and eat it all myself (or should I…? 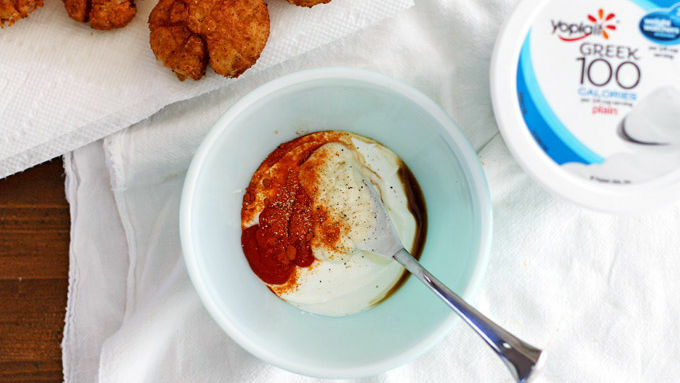 ), I love to make this recipe for Mini Blooming Onions with a creamy, spicy dip on the side. 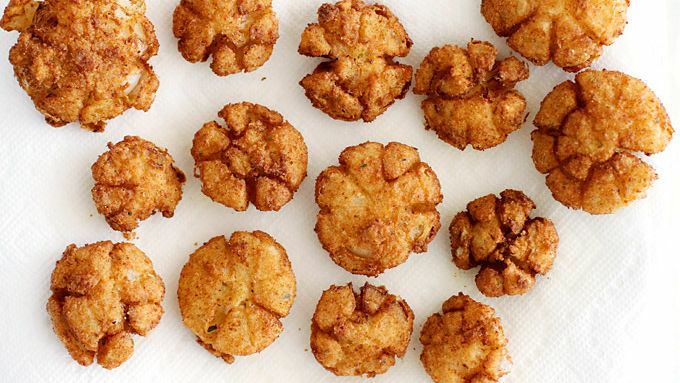 The bite-sized version makes this perfect for sharing the deep-fried goodness with a crowd!